Asphalt Drum Mix Plant Manufacturer India. – MEWAD ROAD EQUIPMENTS We are Leading Road Equipment Company in Ahmedabad. Road Cleaner is machine that meets the toughest cleansing challenges of roads and highways. The mobile road cleaner is fast and efficient for cleaning roads in short time. They are accessorized with water sprayer, dust pan, sweep brushes used to collect loosen particles, dust, municipal waste, stones and heavyweight wastes. Asphalt drum mix plant is system that used to produce large amount of hot mix asphalt or asphalt concrete is a basic raw material in construction application. The produces is homogeneous mixing of aggregates, sand, binder mostly used asphalt which is petroleum products with cement. Distinct collection of core parts is combining to make one whole asphalt plant system. Such parts are Bitumen tank, aggregate bin feeder, vibrating screens, dryer and mixing drums and control panel. construction or in the repairs of roads and highways. The range of road construction equipment is subject to where it is used for construction of new road, road re-carpeting of just minor road repairs. This high-tech equipment makes the construction job easier and quicker. It saves the cost of labor, increase the productivity and offer good quality of work. Usage of machinery in road construction can help to save time, money as well as human resource. Road construction machinery used for various applications includes new road construction, road re-covering and road repairing. Some commonly used road equipment is hot mix plant, soil stabilizer machine and emulsion sprayer. 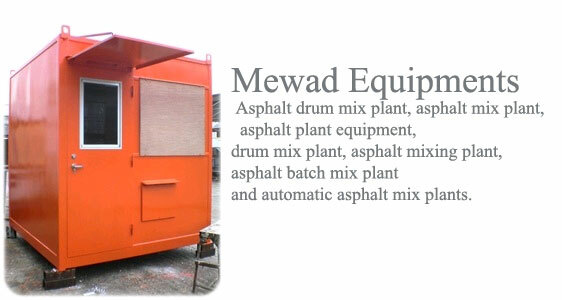 MEWAD ROAD EQUIPMENTS, Ahmadabad – Manufacturer, exporter and supplier of asphalt drum plant, Asphalt Drum Mix Plant,Mobile Asphalt Plant India, Wet Mix Macadam Plant, Road Construction Equipment Company in India. Mobile Road Cleaner, Bitumen Sprayer from Ahmadabad, Gujarat, India. We are inviting Business Associates from Cambodia, Malaysia, Tajikistan, China, Maldives, Thailand, Mongolia and also looking for Marketing Agents from countries like Iraq, Pakistan, Vietnam, Israel, Philippines and Yemen. Welcome to MEWAD ROAD EQUIPMENTS Company. We are introducing ourselves as a one of the leading Manufacturer & Exporter of Road Construction Equipments in India. Furthermore, we have already supplied several plants and machinery. We also manufacture Asphalt Drum Mix Plant, Wet Mix Macadam Plant, Mobile Drum Mix Plant, Mobile Road Cleaner and Mechanical Raver Finisher. MEWAD EQUIPMENTS is a fast growing organization having prime principal of customer’s satisfaction by giving appropriate Latest Technology, Quality & after Sales Services at reasonable rates. Asphalt Drum Mix Plant Manufacturer, Asphalt Drum Mix Plants, Asphalt Drum Mix Plant Exporter, Asphalt Drum Mix Plants Manufacturer, Asphalt Drum Mix Plant India, Asphalt Drum Mix Plant Supplier, Asphalt Batch Mix Plant, Mobile Drum Mix Plant, Mobile Asphalt Drum Mix Plant, Mobile Road Cleaner, Wet Mix Macadam Plant, Bitumen Sprayer, Mechanical Raver Finisher, Asphalt Mechanical Raver, Wet Mix Macadam Plant India. Skid Mounted Bitumen Sprayer & Road Construction Equipment Company India. Kirloskar-HA-294 makes engine 25 Hp. Fully fordable spray bar 2.5 mtr -4.2 mtr. The spray bar consists of 19 No brass spray nozzles & each nozzle has a spraying capacity of 6 ltr/minute. High quality hose pipes ensure that you have tension free spraying. The spray bar can be moved right-left & even up-down. Heavy duty Bitumen gear pump. The unit is fitted with an Air compressor. Compressed air is stored in tank for supply to pneumatic cylinder, main burner, Hand burner & cleaning system. Low air pressure burner Manufacturer Company for heating of bitumen &hand burner for heating of pipe line. We customize Mobile Asphalt Plant as per the customer’s order like Twin Drum Mixing Plant which is accurate in weighing, highly efficient and simple in structure. It consists of mixing drum, dryer drum, central venting and discharge units. The Capacity of this plant ranges from 30 TPH to 90 TPH. Asphalt Mixing Equipment is used as an indispensable role in construction and maintenance work of asphalt roads. The main benefit of this plant is that it is environmental friendly and manufactures asphalt all year round. Our products are recommended for their efficiency and functionality and have low start-up costs as compared to traditional asphalt manufacturing plants. These products are manufactured with accordance to the essential parameters of the various industries to ensure a quality of international standard. 4-Bin Feeder is one of the single chassis construction. At each Bin a radial gate is provided which can be opened in any position to regulate the aggregate flow. Individual endless belts are provided, below the gates to discharge material onto the gathering belt. A fully Automatic Control Panel is provided for controlling the quantity and quality of production with operator sitting in Air-conditioned comfort.Control Cabin is provided with electronic control panel cabinet to operate the entire plant.